Manolo Blahnik as many of you already know are the Rolex of ladies footwear. Combining a extremely high level of craftsmanship with often whimsical designs, Manolo Blahnik has dominated the luxury woman’s footwear market. Manolo Blahnik exploded onto the fashion world in the 1970’s with the release of their unique stiletto heels. These slim heels were a huge departure from the large chunky platform shoes that dominated the fashion industry at the time. Soon Blahnik earned a reputation for a deep understanding of contemporary trends and a genuine feeling for their clientele and what they seek in a shoe. In only a few years Manolo Blahniks had become the hottest shoes on the market, with customers clamoring to get their hands on a pair. Now Manolo Blahnik will be coming to a jewelry store near you! Joining with jewelry designer, Rosa Tous, to turn their most famous heel the Campari into a golden charm. This charm will hang from a gold chain and feature a small diamond as the shoe’s button. The Campari or as it is more often called, Mary Jane was released in in 1994 and feature smooth black patent leather with a pointed toe and strap across the vamp.The Campari heels are sold in both 100mm and 120mm heel heights. Buy Sell Diamond. Judging by Manolo Blahnik past, I would expect this new collection of jewelry pieces to be just as luxurious and highly sought after as their shoes. These pieces will launch in March in 300 boutiques around the worldwide. Raymond Lee Jewelers has had a run of employees being featured in local Florida newspapers this year! We have always recognized the extraordinary talent and skill our employees possess; we are extremely proud that the rest of the world is finally starting to take notice. In early February our amazing watchmaker, Igor Polotsky had a piece written about him in the Orlando Sentinel and this week our leading gemologist, Richard Resnick, was featured in the Sun-Senintel. The original article was in Wednesday’s paper, February 23rd and was entitled Local Jeweler Predicts Oscar Red Carpet Will Be Ballerinas and Bombshells. In it Richard lends his expansive knowledge on the jewelry industry to comment and rate Hollywood’s top actress’ taste in jewelry at this year’s Oscars. Natalie Portman was given four out of four diamonds for her exquisite taste in simple yet elegant jewelry. Heidi Klum on the other hand received zero diamonds for substituting diamond and gold for an dismaying array of African styled wooden bangles. “The ears took center stage as hair was swept off the neck in a simple bun or chignon showcasing a gorgeous diamond stud, creating a ‘ballerina’ effect, a la Natalie Portman,” Richard said, summing up the jewelry trends found on the red carpet. Florida Diamond. Richard Resnick has been with Raymond Lee Jewelers for many years and in that time has garnered a reputation for excellence. As our leading gemologist Richard is responsible for evaluating all precious stones that come into our store and doing appraisals needed for insurance. His keen eye ensures that only the highest quality diamonds and other precious gems make their way into our showroom. You can follow Richard on Twitter at jewelryguruus. If you need a certain item evaluated or appraised come into our store make Richard your number one choice. In real life Angelina Jolie is known to wear classic and feminine timepieces such as the Cartier Tank Louis (click here to read more about Ms. Jolie and her watch). In her latest movie, SALT, where she plays a CIA agent that is on the run after being accused of being a spy, Jolie is wearing a much more rugged watch. The watch featured in the film is the Omega Constellation Double Eagle Chrono World Cup Special Edition. While SALT may have not amassed such positive reviews, the Omega Constellation Double Eagle Chrono on the other hand has. Its amazing 3313 self-winding movement has received widespread praise and recognition. This movement features a column wheel mechanism and co-axial escapement that allows for greater precision, stability and durability. One fact that I find truly outstanding is that this watch has a power reserve of 52 hours which for this mid-priced watch is quite exceptional. Florida Jewelry. Many of Omega’s watches tend to be on the larger size with the average case measuring 45mm, the Double Eagle Chrono breaks from the norm at a slightly smaller size of 41mm. This watch would look perfect for those of you with smaller wrists who have a hard time to finding a watch that makes its presence known without having a large case. The ladies version has a case measuring 35mm and looks great on any woman’s wrist. The watch is available in steel, titanium and red gold, the one featured in the movie is titanium. The special edition is slightly different from the regular version as it has two outlined subdials, engraved roman numerals in the black bezel, the titanium case with black buttons and the black rubber strap. 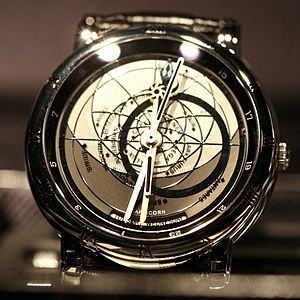 The price for this watch is around $4,800. The popularity of the Panerai brand of luxury watches has exploded over the last decade; which may have to do with the fact that Sylvester Stallone has been pushing Panerai on all his pals in Hollywood. Panerai’s newest watch, the Marina Militare Pam 339, needs no help from Rocky to garner and hold the attention of watch enthusiasts. This sleek new watch has been heating up the watch industry this past year and has become one of Panerai’s top-selling timepieces. The Militare Pam 339 does not stray too far from the traditional Panerai style that we have grown accustom to. The Marina Militare features state-of-the-art technological innovation and a familiar yet distinctive look that allows it to differentiate itself from the rest of the 2010 collection. This watch is definitely a statement piece with its 47 mm case and unique composite case material; it is no wonder they are flying off the shelves. Watch Sell. The composite case is the main attraction of this watch, a first for any Paneria watch, this futuristic material is the result from the ceramization of aluminum through an electrochemical process. This new coating is stronger and lighter than steel and titanium. This composite process was commonly used in the aeronautic, car and motorcycle industries due to its superb capabilities. You can be sure this watch wont be getting any dents or dings while on your wrist. The Militare Pam 339 has rich bronze matte look that gives the watch an either brown or black color depending on the lighting source. The dial and crown also have this same look which contrasts nicely with the milky brown color of the vintage leather strap. The strap has exquisite stitching that is reminiscent of the ecru color of Paneria’s Super-LumiNova. This is a very limited run with only 1,500 watches being released and with a price tag of $26,000. Paneria is slowly releasing this batch so be sure to keep you eyes open if you’re in the market for one as they are going fast. Raymond Lee Jewelers has plenty of Paneria watches on sale well below retail, make us your number one previously owned watch retailer. Every season we here at Raymond Lee Jewelers get a first hand look at the different trends that are sweeping through the jewelry market. This season we are seeing customers flock to our wonderfully priced colored gemstones. Our 3200 square foot showroom has a wide verity of new and vintage jewelry pieces that are set with exquisite colored gems. Lots of our customers are buying sterling silver pieces adorned with either radiate blue sodalite, rich red garnet or vibrant green amethyst gemstones. Rose or pink gold looks great with colored gems as well, a rose gold ring with a large colored gem has a great classic look. These popular gems are very affordable and can really make your favorite spring outfit pop. Collateral Loan. The popularity of this new trend can be attributed to the recent actions of a few celebrities, most notably Kate Middleton. The princess-to-be was proposed to by Prince William and was presented with Princess Diana’s old ring. This ring features a brilliant 18 ct. blue sapphire center stone surrounded by colorless diamond accents in platinum. Some other celebrities that are using colored gems in their engagement rings are Jessica Simpson and Eric Johnson whose engagement ring has 4-carat, oval-shaped ruby stone flanked by two diamonds. Many brides to be are rushing to get their own custom-made rings with colored gems; a service that we offer here at Raymond Lee Jewelers! Designers have taken note and are starting to incorporate colored gemstones into their newest collections as well. Brumani Melange released an 18k gold ring with diamonds, pink quartz, rose de France amethyst, citrine and garnets. David Yurman‘s new Confetti necklaces have blue topaz, citrine and many pieces featuring Tiger’s Eye. Chanel’s Mademoiselle and Coco collection has many pieces that uses colored stones in its pieces. One such ring from this line is 18K pink gold and has colored sapphires, colored stones, a fresh water pearls and a diamond. Raymond Lee Jewelers is one of the largest buyers of pre-owned jewelry so there is a great chance for you to get the these same designer pieces at a fraction of the price.